Ron Galati has decided to roll the dice and put his future in the hands of a federal jury that will begin hearing testimony later this month in his murder-for-hire case. 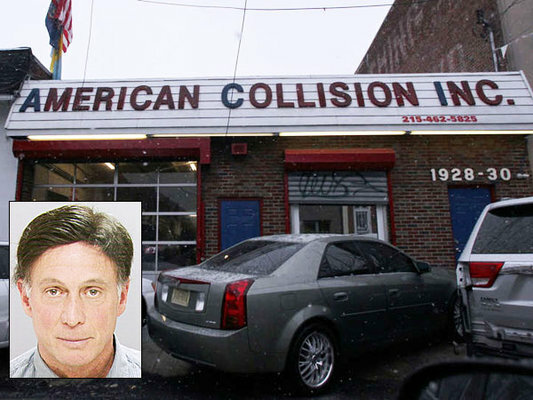 What's more, the South Philadelphia auto body shop owner and wannabe wiseguy is considering taking the stand in his own defense, a move that was hinted at in a motion filed by Assistant U.S. Attorney Jason Richardson, the prosecutor in the case. In the same motion, Richardson alleged that Galati has made frequent payments to two prominent South Philadelphia organized crime figures, mob boss Joseph Ligambi and his nephew George Borgesi, but offered no explanation of what the payments were for. Galati, 64, faces from 15 years to life if convicted. His apparent resolve to go to trial and perhaps tell his story in his own words to the jury undercuts speculation and media reports that he might cooperate with authorities. "I don't know anything about anybody," he has reportedly told those close to him. Prior to the start of a pre-trial hearing this morning, Galati's defense attorney, Anthony J. Voci Jr., said no decision had been made on whether Galati would testify. Voci spent most of the hearing attempting to block the introduction of evidence detailing Galati's alleged prior criminal activities. Voci said that evidence would be highly prejudicial and would make it impossible for his client to receive a fair trial. The prosecution says the evidence should be permitted, but has agreed not to introduce evidence alleging mob involvement. U.S. District Court Judge Joseph Rodriguez said he would rule on the criminal history evidence motion shortly. The trial, in federal court in Camden, is set to begin Sept. 15. Galati, dressed in a green prison jump suit, was brought to court this morning by two federal marshals. He is currently being housed in the Federal Detention Center in Philadelphia. He has pleaded not guilty to a charge that he hired two hitmen to shoot and kill Andrew "Drew" Tuono last year. At the time, Tuono was dating Galati's daughter Tiffany. The two hitmen and a third alleged co-conspirator have all admitted their roles in the murder plot and have agreed to testify. Tuono was shot three times outside his Atlantic City home on Nov. 30, 2013. He survived. Tiffany Galati, who was with Tuono at the time of the shooting, may also be a witness for the government. Galati, a long-time associate of prominent Philadelphia mob figures, is facing two other criminal cases in Common Pleas Court in Philadelphia. In one, he is charged with hiring the same hitmen to kill two rival auto body shop owners who he believed were testifying against him in a major insurance fraud investigation. In the second case, he, his wife, his son and more than a dozen other co-defendants are named in a multi-million dollar insurance fraud scheme. One of his co-defendants is Ligambi's son. The prosecution in response to a motion filed by Voci earlier, has said it does not intend to introduce any testimony about Galati's alleged mob ties, but reserved the right to address the topic should Galati's defense "open the door" on that issue. In a pre-trial motion Richardson wrote that, "Although multiple organized crime and `mob' ties exist and are relevant to this case, the Government does not foresee the introduction of this evidence. However, the Government reserves the right to introduce references to the mob and/or organized crime associations and/or activity if through argument, questioning, and/or testimony of the defendant `opens the door' or mentions these topics." Richardson also noted that prison records indicate Galati spoke with Ligambi by phone on at least three occasions while Ligambi was being held in the Federal Detention Center and being tried on racketeering charges. Ligambi, 74, beat most of those charges in two trials. The remainder of the case was abandoned by the government early this year. Richardson also wrote that, "On January 28, 2014, two days after Ligambi’s release from FDC Philadelphia following an acquittal and a deadlocked jury, law enforcement surveillance observed Ligambi at the defendant’s business, American Collision. Further, throughout the investigation of this case, it was learned that the defendant made frequent payments to Ligambi and his associate, George Borgesi, through a third party and sometimes twice a week through hand-to-hand transactions at American Collision." Borgesi, 51, was acquitted in the same trial as his uncle. Richardson's motion did not offer any explanation for why Galanti may have been funneling money to Ligambi and Borgesi. The mob's alleged role in an earlier Galati insurance fraud scheme that led to his 1995 conviction for fraud was alluded to in witness testimony during the Ligambi/Borgesi trials. During arguments before Rodriguez today, Voci said the defense would not dispute the prosecution's claim that Tuono was shot by Ronald Walker and Alvin Matthews and that Jerome Johnson, a long-time friend of Galati's, provided the gun and helped set up the hit. All three men are now cooperating witnesses. But Voci said the reason for the shooting was not what the prosecution claims. Galati, should he take the stand, is expected to deny that he had anything to do with the shooting. Voci also argued that the prosecution should be limited in what additional evidence it can present to the jury about Galati's past criminal activities. Galati's conviction for insurance fraud in a 1995 case, for example, should not be permitted because rules of evidence prohibit the mention of crimes that are more than 10 years old. Galatai was convicted and sentenced to 37 months in prison in that case which in many ways echoes the new insurance fraud case pending in Common Pleas Court. Voci also argued that allegations that Walker, Matthews and Johnson were paid by Galati to vandalize cars and set fire to a boat and a tow-truck should not be permitted because those events, even if true, had nothing to do with the murder-for-hire conspiracy that is part of the Tuono case. Finally, he argued that any mention of the murder-for-hire case pending in Philadelphia would be highly prejudicial because the allegations are virtually identical to the allegations in the case now pending in federal court. In both murder-for-hire cases, authorities allege Galati offered to pay Walker and Matthews and used Johnson as the go-between to set up the hits. The shootings in Philadelphia never occurred, authorities said, because the targets, Joseph Rao Sr. and his son Joe Jr., had closed their autobody shop before Walker and Matthews could make a move on them. The prosecution argues that evidence about Galati's criminal relationships with the Walker, Matthews and Johnson help explain why the three would agree to commit murder for Galati and for that reason should be presented as evidence. Richardson, in his motion, said evidence of Galati's relationship with the three men could also be used to counter any testimony that Galati might offer. The prosecutor suggested that Galati planned to take the stand and argue that "he had no association, especially criminal, with his co-conspirators and that the shooting of the victim was unrelated to the defendant’s relationship with him. Moreover, the Government anticipates the defendant will testify that the motive behind the Victim being shot was due to the Victim `owing people money,' `constantly getting in to fights' or his drug use/dealing." Bits and pieces of the prosecution case have already been outlined in pre-trial motions. Among other things, authorities allege that Galati had threatened Tuono at a restaurant in Northfield in June 2013. The restaurant, identified today by Richardson as Salvo Kitchen, was owned by associates of Bogesi's, according to law enforcement sources. Those same sources said Galati "liked to hold court" while dining at the restaurant and frequently alluded to his mob connections. While authorities have never clearly indicated why Galati wanted to harm Tuono, Richardson's motion contends that at one point Galati said he would kill Tuono himself. "Galati told Michael Otterson [a potential witness in the case] in sum and substance that Galati would `kill him myself, I will strangle him, I will poke his eyes out' and `I am going to stab him right in the forehead with this thing,' referring to an ice pick type device," Richardson wrote. "In June 2013, Galati, members of Galati’s family and associates, including his cousin Anthony Valenti, had dinner with Tuono and Tiffany Galati at a restaurant in Northfield, New Jersey. During dinner, Galati took Tuono into the kitchen and threatened to kill him. Thereafter, Johnson and Mathews advised Tuono that if Galati was to instruct them to kill Tuono, they would follow through with the request." Another document indicates that on the night of the shooting, Matthews and Walker were told that if there was a girl with Tuono, she should not be harmed. Tiffany Galati, who is expected to be called as a witness, was standing next to Tuono as three bullets were pumped into his body. Now estranged from her father, she has given a statement to authorities and both she and Tuono have been interviewed in detail. They are no longer a couple, according to sources, but both may be used by the prosecution to build its case against Galati.